Pierogi Skillet | EASY AS PIE! It is snowing like a mo’ fo’ out there! Everyone be safe tonight and tomorrow! 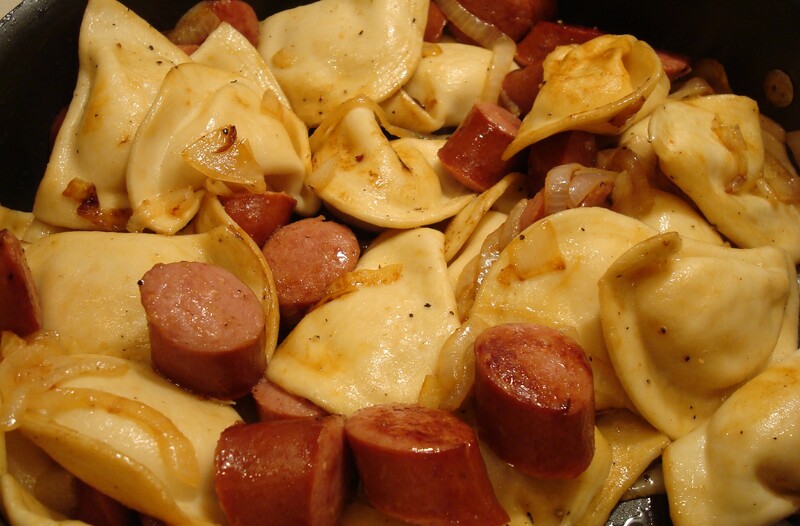 This is hardly a recipe since it simply uses store bought ingredients, but it is quick to throw together on a weeknight using pierogies from the freezer. I wish I could make pierogies from scratch, but I just don’t have that kind of time. And can I just say that I have no idea if pierogi is spelled with an e on the end or not? Hmmm? I googled and it came up both ways. Boil water in a large pot and drop in the pierogies. Allow them to parboil for 3-5 minutes. Meanwhile, heat a large skillet and melt the butter in the pan. Add the sliced onion and kielbasa. Cook until kielbasa is browned and onions are tender. Add salt and pepper. Drain the pierogi and add them to the skillet. Cook for a few minutes, just until lightly golden. Then serve up this deliciousness!